Many travel insurers offer free cover for the average family with a couple of children, but there are companies out there who do go the extra mile to attract the larger family - and it makes sense. 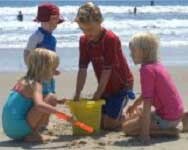 Claims from children are very low, so it does not 'cost' the insurers much - and it helps build a relationship with the next generation of travellers. We track down travel insurers who design their policies for the larger family - and let you know why some policies look very similar! We also suggest you use our Travel Insurance comparison service - many insurers are happy to cater for families, and insurance for a two week break in Spain can run from less than £15 for the whole family. But now let's look at policies which cover at least 4 children free - although if you have two children or three they will be happy to insure them at the same price too! Debenhams on occasion offer voucher codes - normally in the form of a discount coupon which can be redeemed in one of their stores - if we are aware of any such codes we will promote them on our travel insurance discount code pages. World First are a highly regarded Travel Insurer known particularly for their ability to cover a wide range of pre existing medical conditions at highly competitive rates. Whilst they only cover a maximum of 4 children free they are well worth considering if you do need to cover any illness past or present, even if your party size is larger, as their price including the loading for the condition may well work out cheaper. Finally do make sure all in your party have got an EHIC (European Health Insurance Card) if you are travelling to any EU country, Iceland, Norway, Liechtenstein and Switzerland as you can then obtain medical treatment in a public state run hospital for the same price as a resident of that country would pay. That can mean free, or a small discount off the private rate. How it can benefit you is that, if you use it, many travel insurers will waive their excess - so do get one for each member of the family. Get your cards from the EHIC website, call 0845 606 2030 or get a application form from your Post Office.